For those of you old enough to remember, there was a time in the ‘80s where studio photographers thought it would be a fantastic idea to superimpose one photo of a person in the corner of another, with often hilariously awkward results. Which makes it no surprise that this particular meme came up on the site Awkward Family Photos. The meme in question utilizes just such a photo, of a young, prepubescent freckled boy in a band outfit gazing seriously out. 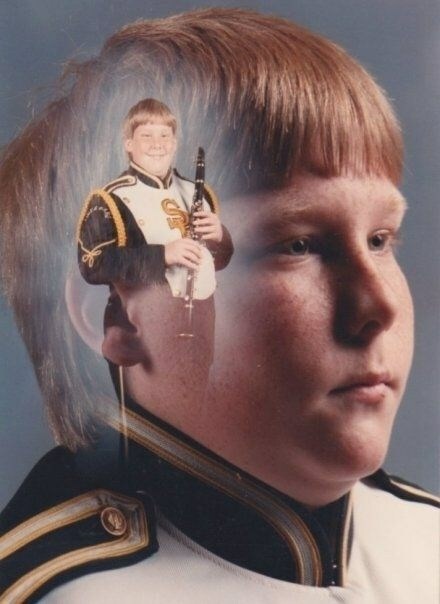 The second photo of him is actually superimposed on his own head, and this one shows a contrast in expression for he is happily holding a clarinet. Someone decided to create a story about the boy and his trusty clarinet, choosing to give the boy various characteristics of a Vietnam Veteran suffering from PTSD (Post Traumatic Stress Disorder). The juxtaposition of this sweet clarinet boy and a painful, horrifying traumatic past proved to be a winning formula in the meme world, and PTSD Clarinet Boy was born. Many of the variations of this meme include hauntingly funny reminiscing about a tortured, war-filled past in the jungles of ‘Nam. The idea that an adorable little boy has such a tragic past became an appealing and humorous meme, and the meme took off. Notable uses of this meme include: “I have seen things … No man should ever see”, and “You weren’t there man … You weren’t there”.